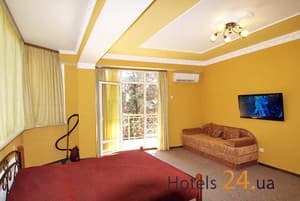 The guest house is located in the center of Yalta, near the sea, a 5-minute walk to Massandra beach and 10 minutes to Yalta embankment. Near the house there is own parking and food shops. Cafe / restaurants are located on the waterfront or on the beach. One-room apartment with all conveniences, with new furniture and European-quality repair. At the entrance is equipped kitchen (dining table, set of dishes, electric stove, refrigerator, electric kettle, washing machine). Large bright bedroom with access to the balcony. In the bedroom there are two beds (double bed and sofa extendable), wardrobe mirror wardrobe, TV, air conditioning. Free Wi-Fi is available. Its heating, cold / hot water is always available. The apartment can accommodate up to 4 people. The distance to the bus station in Yalta is 2.6 km. PRICES MAY CHANGE, IT IS REQUIRED TO UPDATE INFORMATION FROM THE OPERATOR. Description of the room: One bedroom apartment with a spacious balcony. Two beds (a wide double bed and a sofa sliding), TV, air conditioning. The kitchen has all appliances and utensils. District hotel "Oreanda" and the cinema "Spartacus." City center. The house is located opposite the Polikurovsky church. Near the beach Massandrovsky and Yalta embankment - 400 meters. The distance to the bus station in Yalta is 2.6 km. From the railway station of Simferopol on any transport to Yalta. Near the railway station of the city of Simferopol (exit to McDonald's, in the direction of the tower with a clock) are auto- and trolleybus stations. From there, by regular bus, fixed-route taxi or trolleybus number 52 you can get to Yalta in 1,5-2,5 hours. By car: from Simferopol, go along the M-18 to the Angarsk pass, then through Alushta - along the upper inter-city route (landmark, so as not to get lost in Alushta - the wires of the intercity trolleybus), then go along the upper inter-city route (M-18) along the entire South Coast another 41 km to Yalta. There is a transfer from the bus station of Yalta.